Please submit a quote request and we'll send a quote including shipping costs within 24 hours. We ship two display cases per pallet. They are fastened to the pallet, wrapped with protective panels, covered and strapped. Each pallet is 48" wide x 52" long x 50" high. Liftgate service will be arranged if you do not have a receiving dock. Shipping weight for one counter display is 375. Two displays are 750 pounds. Can I customize my displays? Each display has an interchangeable face panel. By default it is matte black powder coated steel. We can swap the front panel for real wood veneer or laminate to match your interior for a nominal cost. Customizing beyond the front panel is possible but has associated costs which vary on quantity. All of our displays are 48" wide. Please see individual displays pages to see more detail. We do not make a 5' or 6' display. A larger span of polycarbonate compromises security. We do sell corner cabinets and 1 foot and 2 foot filler cabinets. I got my display cases but there are no lock cores! 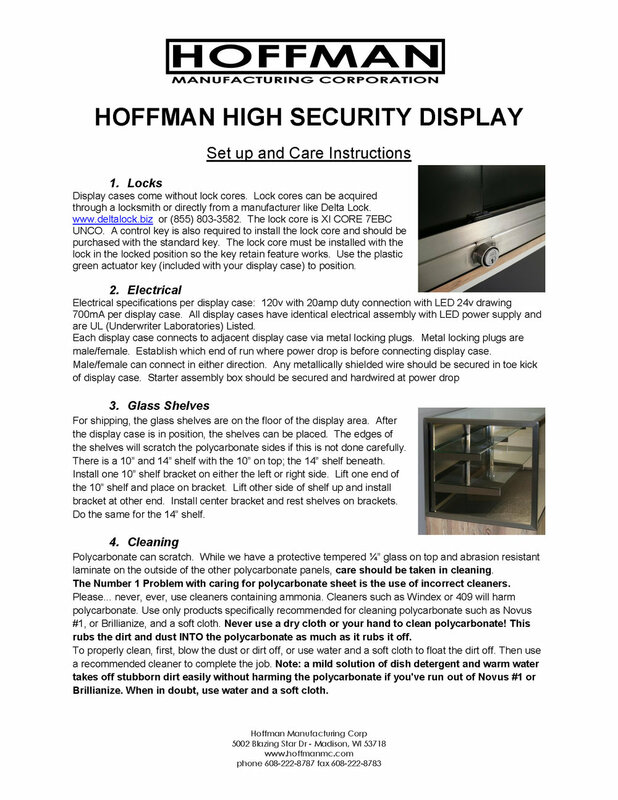 Will my insurance company offer a discount if I use Hoffman displays? You insurance company is the one to ask. We have heard that many insurance companies offer a discount if you store your firearms in our display cases.